Eligibility Graduate from a recognized University. Scores of CAT/MAT/CMAT/ATMA/GMAT and other national level entrance exams is also accepted. Top recruiting companies Flipkart, Amazon, HDFC Bank, Mahindra & Mahindra, Edelweiss, Myntra, Alibaba, HCL, Adobe, etc. Why this MBA in E-commerce? E-commerce (Electronic commerce or EC) is a business model wherein the buying and selling of goods take place over electronic means. With a considerable rise in the Internet users in India, e-commerce today itself is a US $16 Billion market with a seven-fold rise by 2020 as reported by Morgan Stanley. 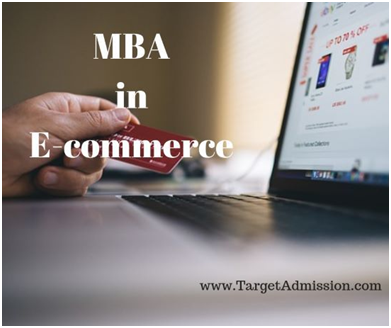 The benefit of earning an MBA in e-commerce is one understands the traditional element of the administrative study with an additional key focus on the latest marketing and business strategy in the online market. Students can also check out our MBA in Fashion Management Article. Various contents of this program include Marketing research, Strategic management, Advertising, and sales promotion, Supply chain management etc. Online Shopping, Logistics, e-business solution companies, e-banking are a few top hiring sectors. The candidate also gets to work on different domains like Digital Marketing, Consumer Behaviour, Media and Marketing while understanding relevant issues. The duration of the course is 2 years. The course fee is Rs 60,000 and upwards. Candidates can also study this specialization through distance learning. Suresh Gyan Vihar University offers a 2-year Distance MBA in E-commerce. Depending on the requirements the job is usually indoor but fields like Advertising and sales promotion requires the candidate to step out for various client meetings and presentations. A job in processing and logistics may involve irregular timings and late hours. Working hours are about 45-50 hours a week but may vary depending on the designation and scale of the business/company. Candidates having prior technical knowledge are best suited for this job. Knowledge of HTML, CSS, PHP, Photoshop, Dreamweaver, Magneto etc are pre-requisites. Website development, Design, and layout, Front-end/Backend developers, web analyst are the major roles played. Being an innovative and creative job, it requires the job-holder to keep up with the changes in web-design, security, and maintenance. With a growth rate of around 15-25 %, the expected salary can be anywhere around Rs 25,000-40,000/month. Though, many professional web developers earn up to six figures. Consultants provide guidance to business owners who want to sell their product and services or promote their business online. Even established businesses hire them to increase current sales and layout business plans. A consultant can work with a company or offer his services as a freelancer. The salary differs according to the experience in the field. They provide/create opportunities for potential growth through the internet as a medium. Promotion campaigns and digital marketing are key roles of this job. Other jobs include working on media budget and contracts, marketing plans, selecting of advertising media etc. Businesses hire such personnel to create lucrative/attractive advertisements for potential clients. Other than online business, ad agencies are also key recruiters of such professionals. Salaries offered are quite appealing, ranging between Rs 5-7 lacs. A manager coordinates with all aspects of logistics which involves planning and strategy, the source of materials, manufacturing, delivery, and logistics and return. The major responsibilities are preparing chain models, review supply chain practices, minimizing shortages and keeping costs down. It is not a regular hour office desk job and involves outdoor work. The remuneration ranges between Rs 4-10 lacs depending upon the experience and scale of business. A person with a degree in e-commerce can open an online store, selling goods or services through their own commercial website. An entrepreneur venture may require marketing skills, customer service, creativity, risk-taking ability etc because the graduates are aware of business strategies and techniques it is easier for them to understand business administration. The income earned may vary depending on various factors like type and range of products, marketing, and promotion, competitiveness, industry demands etc. A freshly graduate in this industry can expect an average remuneration of 3.2 Lac, but this depends on the college, designation, and company. Associates with more than 2 years and less than 5 years of experience get paid anywhere around Rs 4 to 10 Lac. As per pay scale (September 2017), the median salary of the industry is around Rs 4.8 Lac. As per reports by Times of India, The mid-level executives in e-commerce industry earn as much as a top-level employee in IT industry. According to Industry Body and Mobile Association of India, e-commerce market is expected to grow 33% this year as compared to already set up IT industry which is will be growing at 12-14%. Experience of over 14 years can land the employee with a package between Rs 50 Lac to 1.5 crores annually offered by e-commerce giants like Snapdeal and ShopClues. Principles of Management Managing in today’s environment, theories of management, managing the organization resources, anatomy of an organization, managerial control. Account and Financial analysis Overview, Mechanics of accounting, Analysis of financial statement, funds flow statement, cash flow statement. Managerial Economics Demand analysis and forecasting, production and cash behaviour, pricing, profit policies, and planning. Research Methodology Research Design, Information Collection, sampling, Statistical Technique and report writing. Communication for management Nature of communication, writing techniques, recruitment and employment correspondence, Persuasive messages, Reformulating and summarising. Business Environment Socio-cultural environment, Industrial environment, Economic environment, Technological environment. Computer Applications Fundamental and computer applications, MS-word, MS-Excel, PowerPoint, and Database managing system. Software Engineering Intro and models, Planning and managing the project, Capturing requirements, Designing systems. Introduction to E-Business Mobile and wireless computing fundamentals, Handling money, Inter-organisation business, Security, and e-business. Object-oriented methodology General forms of C++, Arrays and pointers, Inheritance, Virtual Function. Marketing management Marketing concepts, Market segregation/targeting/positioning, Product design, Pricing decision, Distribution decision, Emerging trends. Strategic management Business policy, decision making, External impact and impact, Formulation of strategy, Functional strategy. Project Management Formulation of projects, Ranking/screening/evaluation, Financing, Operational problems, cross-cultural issues. Operational Research Linear programming, Solutions, Transportation/assignment problems, Queuing theory, PERT & CPM. JAVA Language and HTML User Interface, Database, Creating web page, Animating graphics. Web publishing and hosting Web servers, Publishing systems, Maintenance, IPR issues, electronic publishing issues. Summer training report and Case study Internship Period – 6 to 8 weeks. Case study- 8 to 10. Server Administration and securities Need for securities, EDI concepts, Electronic transactions, Encryption, Security terms. E-Commerce strategies and models Factors affecting, Issues and challenges, Different models, Payment schemes, E-commerce applications. NOTE– The syllabus for MBA in E-commerce may differ from college to college. Though, the above list is competent enough for general consultation. The admission is based on Devi Ahilya Vishwavidyalaya Common entrance test (DAVV CET) Rs. 88,200. Top Placement companies are- Aditya Birla Group, Deloitte, HDFC Bank, Nestle, SBI Life, Zee Tele Films. The admission criterion requires a candidate to have at least 50% in graduation and selection is based on MAT or CAT or LPU-NEST Entrance exams Rs 4,00,000 Top placements companies are- ACCENTURE, Coca-Cola, Cognizant, Dell, IBM, Honda, NIIT, Infosys etc. The maximum salary offered to students was 17.2 Lac with an average salary being 8.2 Lac. Companies like Microsoft, 99 Acres.com, Mahindra and Mahindra, HT media, American Express are part of their placement cell. Institute of Rural Management (FMSIRM), Jaipur Admission is based on CAT percentile. Maximum salary offered is around 12 Lac per annum. Top recruitment companies are Havells, Fullerton India, Hindustan zinc limited, International Tractors Ltd, IndusInd Bank. Over the years the institute has maintained a 100% placement record. The admission criterion is a minimum of 50% in graduation. Because the intake is just 20 students for this course, occupying a seat is highly competitive. The candidate should clear CAT or CMAT or any other national/domestic management entrance exam that is specific to the college or university. The above-mentioned requirements are just basic criteria for an admission. Additional to them, a candidate should be competent with good communication skills, leadership qualities, and confidence which will help them to clear group discussion rounds and personal interviews. As per International Monetary Fund and Central Statistics Fund (CSF), India has the fastest growing e-commerce market and third largest internet population in the world after USA and China. With a considerable number of internet users and growing acceptability of online payments, the country today is home to at least 3,311 e-commerce hubs. The market space of the country ranges from electronic gadgets, fashion accessories, matrimonial services to the likes of books, travel, movies etc. Segments such as e-retail in Consumer Electronics, Home furnishing, and fashion appeals have found a break-through in the industry. Ease of internet access, Safe and secured payment, door-step delivery are few major factors for the revolutionary growth of this sector. Also, massive growth in the mobile industry has given rise to m-commerce with many sites operating through Mobile apps. Lastly, the introduction of the Indian government’s scheme like Make in India, Digital India, Startup India, Rurban and allowing 100% FDI in e-commerce market are the few steps to give a major boost to this sector. Also, encouraging e-commerce solution companies to expand and provide the facilities to help entrepreneurs to build new online stores and be part of this exceptional growth.